Divide By Cucumber . . .
. . . Reinstall Universe And Reboot. I thought I was handling this just fine, after all we all knew it was coming. I heard the news on Thursday and while I’ve been sad, I thought I was mostly OK. Then I walked into the library to exchange my books and there was a big pile of books along with his picture. I started to cry. The librarian who put them there started to tear up. We talked for a few minutes and then we laughed. Proper fitting memorial. I got home (with my new books) and found the invisible wombat wobbling around in circles muttering (wally, wally . . . Crivens!) This is not a good sign. The ground under my feet doesn’t feel quite real, I feel distinctly off balance, nothing is quite right. (There is however the distinct possibility that this surrealness is due not entirely to my grief but instead to a recent (brief) severe illness and hospitalization.) FYI — the invisible wombat is not a Terry Prachett invention. The invisible wombat is mine and he’s been with me practically forever. For a better idea of the dynamics of this relationship watch the movie Lilo and Stitch — I’m both of them. If you’ve no idea whatsoever who I’m talking about . . . well I pity you. You’ve been missing out on something entirely wonderful. 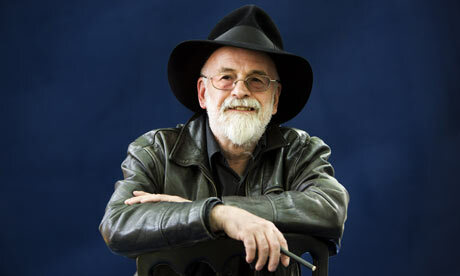 Here are a few things you should google: Terry Pratchett, Discworld, Discworld quotes, Hex (explains the heading of this post). Don’t forget to click for images. Google has helpfully put up a list of his books — click on it. Then go read them. Meanwhile I’ll be trying to pull things together. So far the best I’ve managed is a momentary state of “out of cheese”. Which is dire enough to be going on with.